Anti-Epal Bill is OK but how about the Kapalmuks? 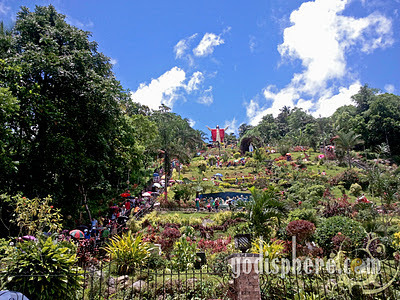 Lucban Quezon is actually great for any kind of traveling, as it also provides many attractions including the colorful Pahiyas Festival, food tripping - pancit hab-hab, as well as gorgeous nature - Mt. Banahaw. However, aside from old churches, places of interest also include spiritual and healing sites. 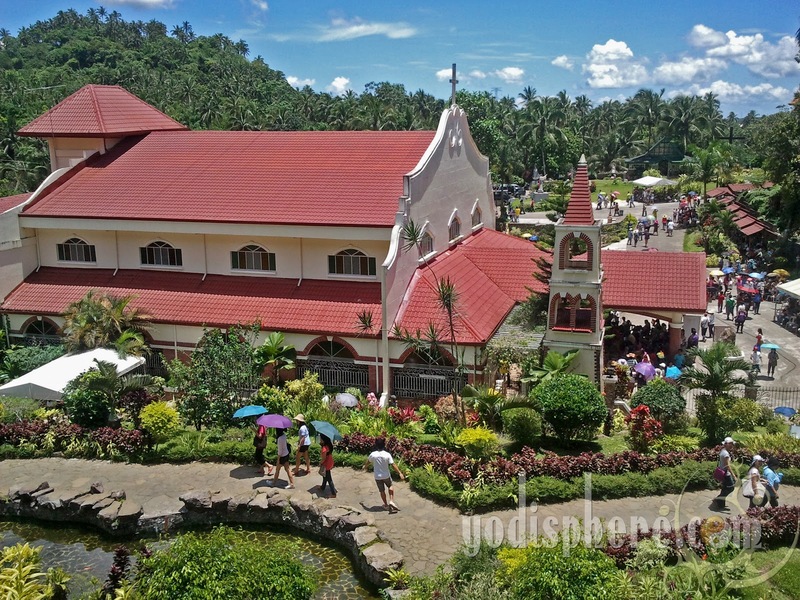 Visitors wishing to benefit their spiritual life and seeking to get healed, physical and spiritual, should definitely take a side trip to Kamay ni Hesus Healing Church in Brgy. 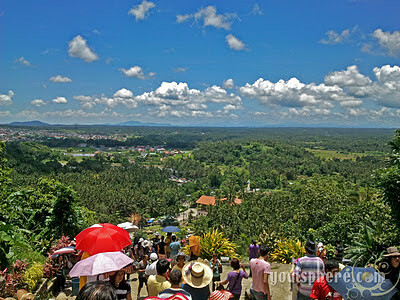 Tinamnan. 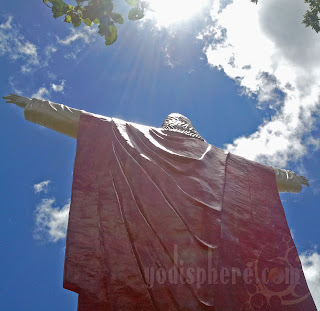 This Catholic national landmark, popularly known as “Kamay ni Hesus” was built around 2002 by the Kamay ni Hesus Ministry Foundation, Inc. founded by the renowned faith healer Rev. Fr. 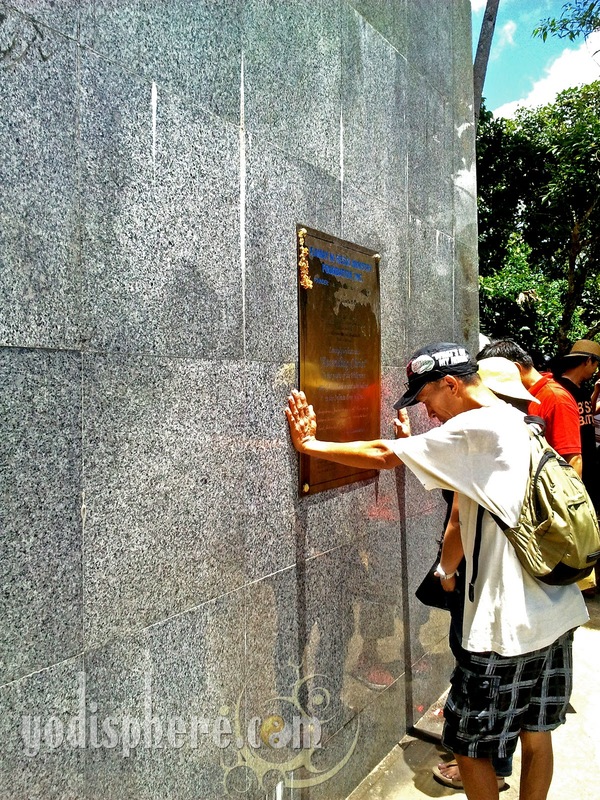 Joseph "Joey" Ayala Faller and the Javierto-Brizuela family. Fr. Faller, ordained priest, and a 2009 Gusi Peace Prize Laureate for divine healing and humanitarianism, now runs the place. 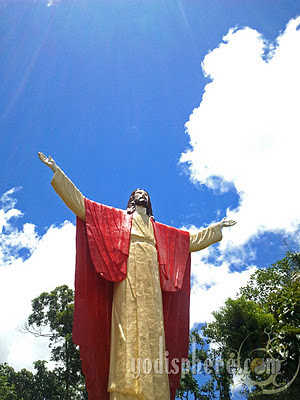 Regular healing masses are held at the healing center at the foothill where a 50-foot image of the resurrected Jesus Christ is located. Noah's Ark-themed playground is also available in the area making it great for family trips. 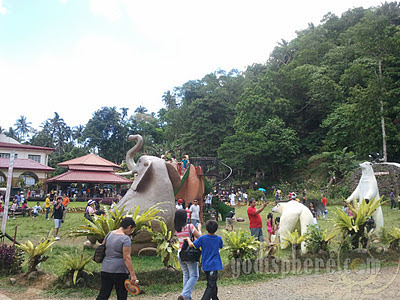 This park is conveniently situated at the back of the healing center and church, thus it is very advantageous for adults to attend the healing mass while their children play at the park. Another imposing structure beside the children's park is the Noah’s Ark which serves as a place of prayer and meditation. 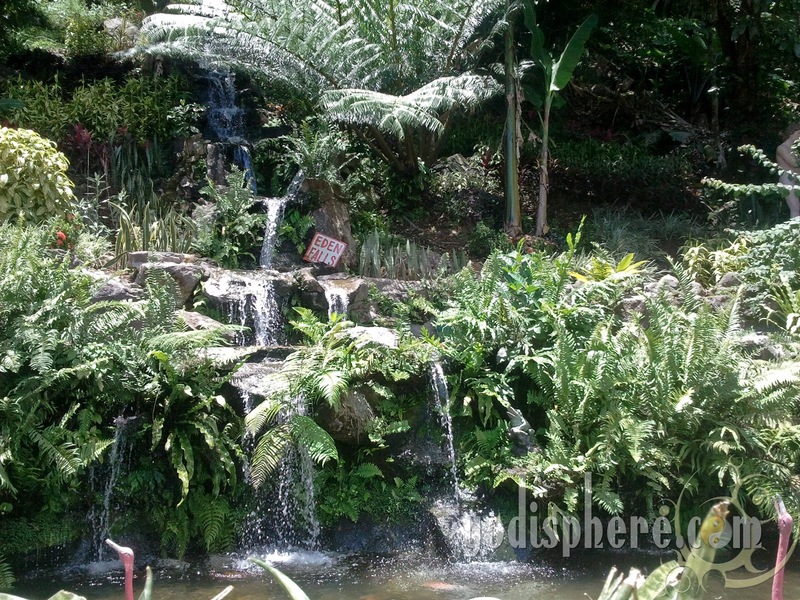 This house of prayer has fully furnished air conditioned rooms for pilgrims and those who are attending retreats. The place welcomes anyone who would like to experience quiet time through private and group retreats, recollections, seminars and workshops. 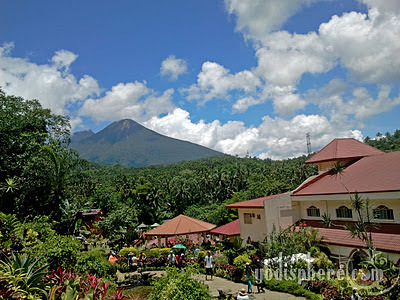 The fountain of healing water (From Mount Banahaw) or the Eden Falls that is starting from the grotto of Mama Mary-Our Lady of Lourdes is also said to have healing powers. 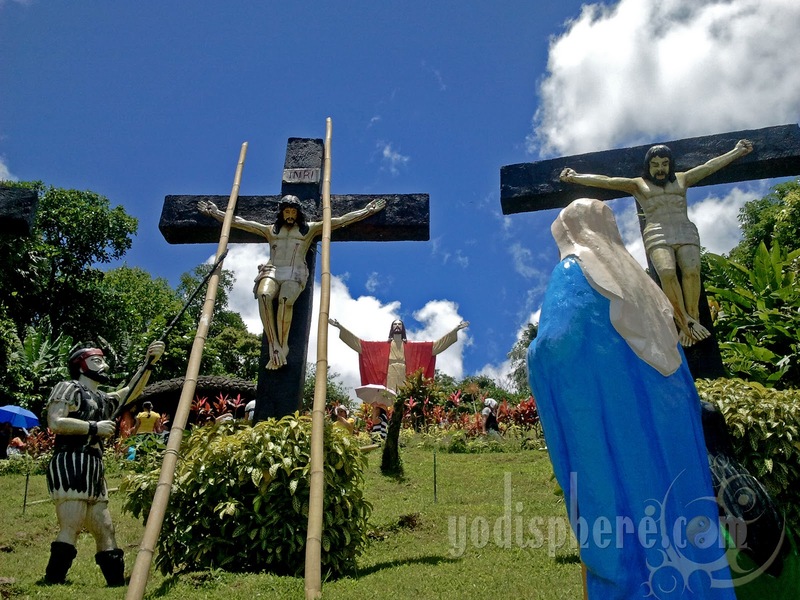 The whole place is full of statues and scenes depicting biblical scenarios making it a famous destination during Holy Week. 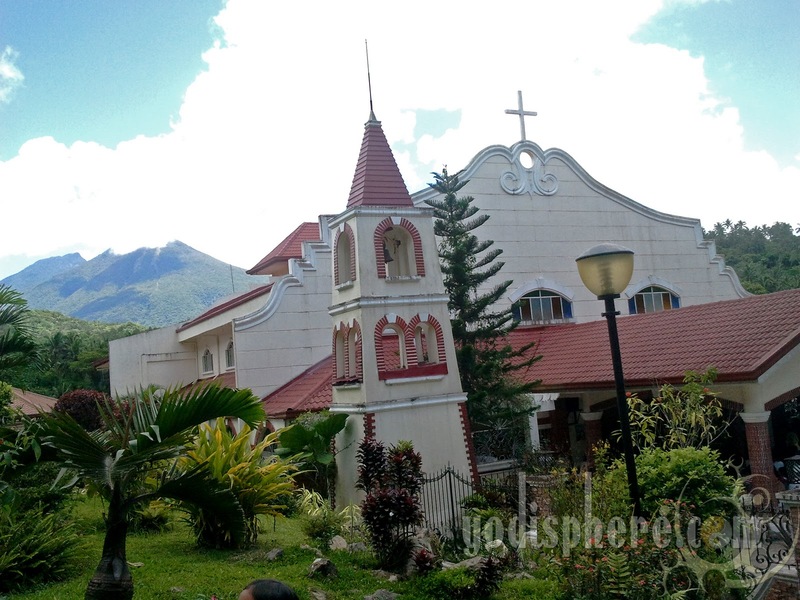 The picturesque healing center and church, perfectly situated at the foot of the hill is where people attend healing mass and pray. The Grotto, and Via Dolorosa has 257 steps altogether-taller than the one in Baguio City. 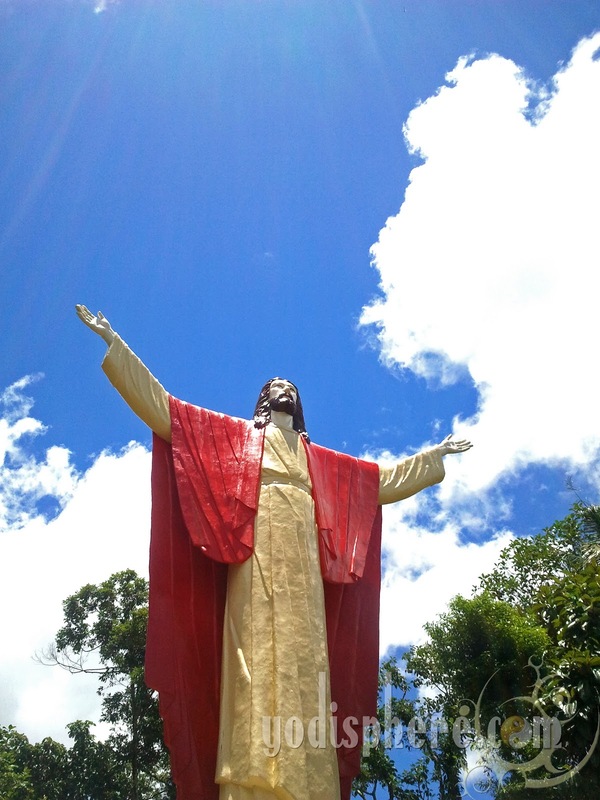 At top of the hill, is the50-foot image of the Resurrected Christ. 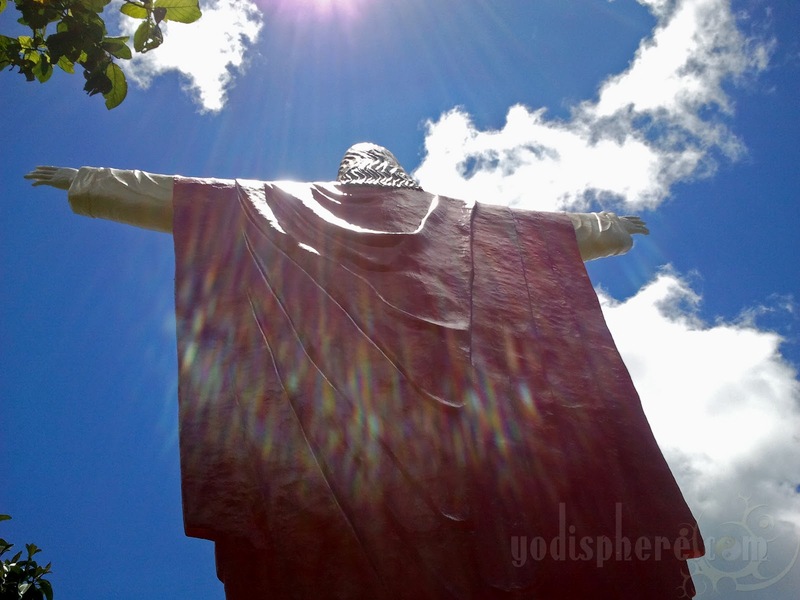 It is believed that it is bigger than that of the Christ the Redeemer image of Brazil. The stations of the Cross are along the pathway and at the center is Mama Mary-Our Lady of Lourdes. Kamay ni Hesus was built on the slopes of Mount Banahaw in Lucban Quezon, thus giving it a serene and perfectly calm environment. 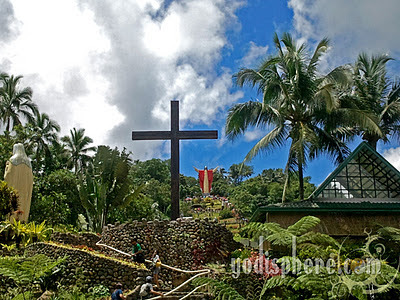 Kamay ni Hesus becomes too crowded during the Pahiyas Festival and Lenten Season. The distinct landmark of the area is the 50-foot image of Jesus Christ located on top of the hill with His hands open wide as if welcoming pilgrims. 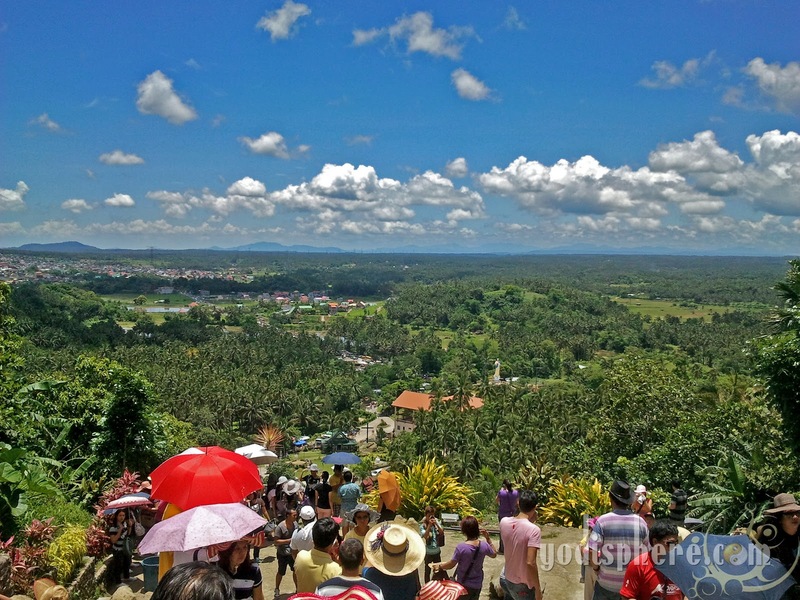 Exhausted and sweaty after climbing the 257 steps, pilgrims usually spend time touching the base structure while praying at the foot of the Jesus Christ statue. This "Ascending Christ" was sculpted by the artist Bernardo "Bernie" Caber of Black Nazarene Ent. 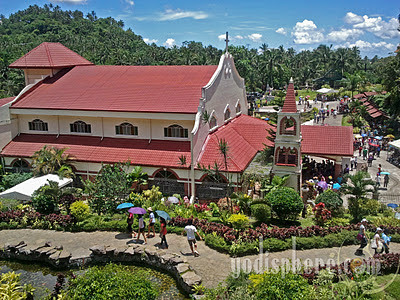 General Description: Place of Catholic worship, Park, popular Holy Week pilgrimage site, Sidetrip site during the Pahiyas Festival. 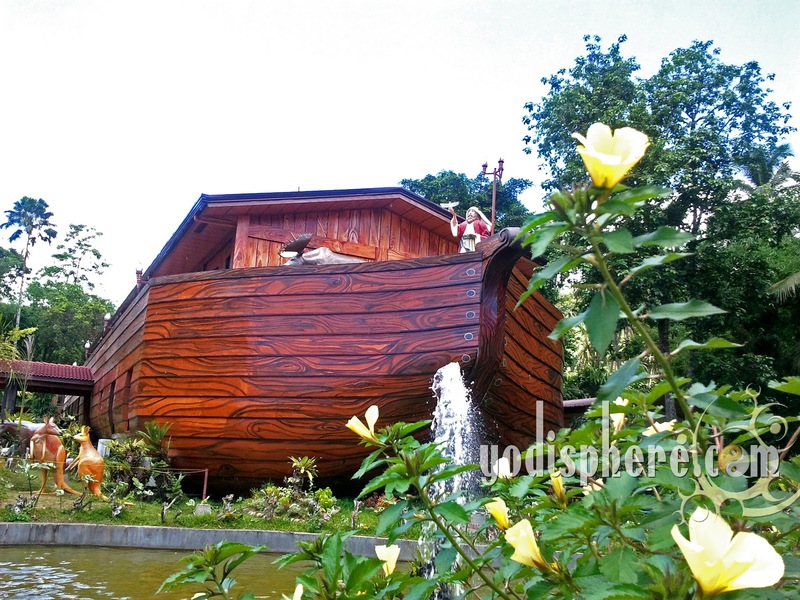 Facilities: Luklukan ni Maria, Retreat Center, Grotto's Restaurant, Hill of the Ascending Christm Kamay ni Hesus Healing Church, Garden of Eden, Noah's Ark, Eden Falls, Rest rooms and parking area.